So I decide to do the journal challenge. 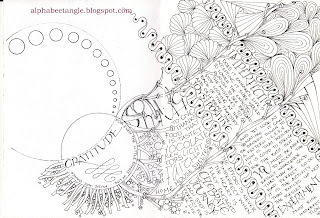 Each week a theme to write about and a tangle challenge. Thought I would get right on it, but I did not. So yesterday & today I worked on catching up. 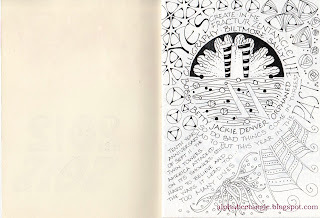 This is week one - reflections on 2011. After I had completed the '11' I saw it - The Twin Towers. 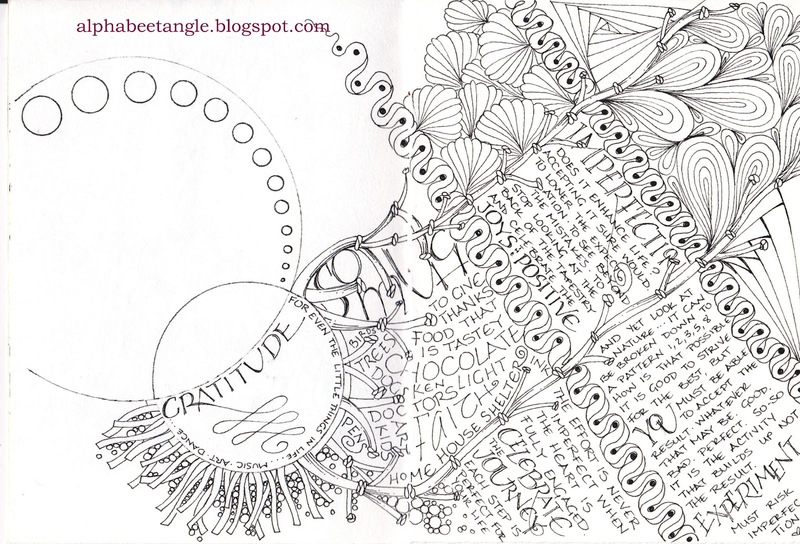 I just love this tangle by Sue, and now I can do it! Different strokes for different folks. Yesterday was a creative day @ Random Arts in Saluda, NC. 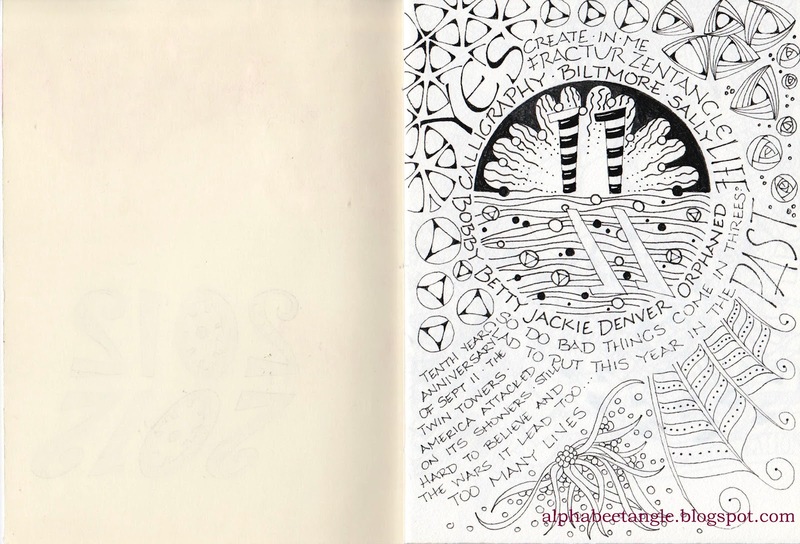 We gather together for a bi-monthly time to tangle, play with patterns, share ideas, work in journals, whatever the flow is. Yesterday the flow was strong! So here is my spread for week 4 & 5. Week 4 was to use bubbles or circles in the art. The writing was to flow from Gratitude. Week 5 was to use a tic-tac-toe layout and use 5 spaces for patterns and 4 spots for writing reflections on how imperfection can enhance life. 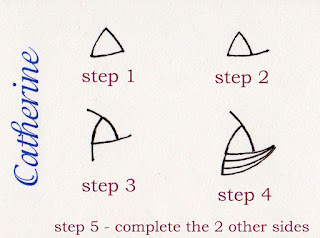 This is cool, I didn't realize there were names for certain types of doodles like the tri-po. Interesting. Here I have been doodling for years and had no idea, huh? you learn something new everyday. Your approach to Tri-Po works for me! Thanks for sharing it, and for all the beautiful and inspiring content you have posted, both text and images. And text AS image, of course. Your reference to Saluda got me excited--it's such a tiny town! We pass through it every now and then, and I know there used to be a neat stamp/paper ats store there, but I didn't see it the last time we passed through. I will click that link and see where it takes me. Yes, it was great fun Catherine and I am really starting to love that Tri Po pattern. I can see so much possibility with that one. Your positive energy & creativity is infectious... thank you so much. 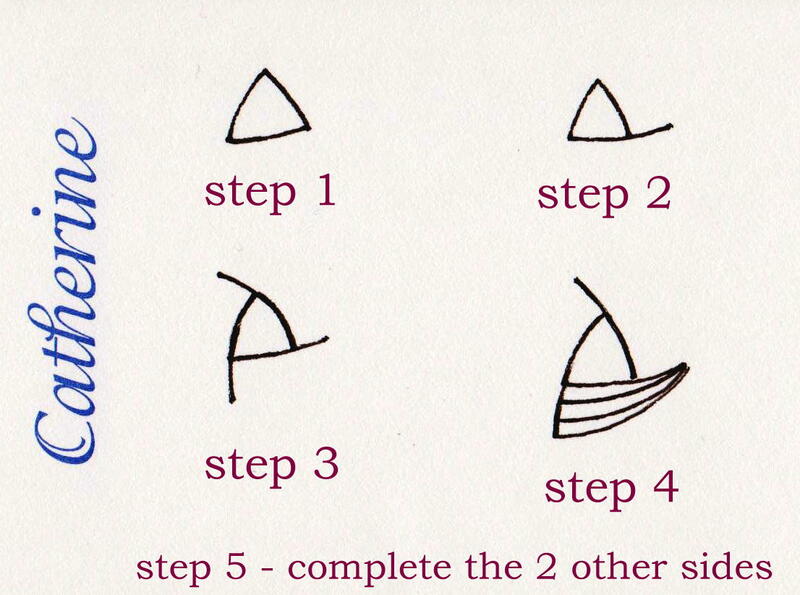 BTW, I need an Alpha Doodle jpg for my website for the class that you are teaching here on March 30th. I love love love Tri-Po, but it has been on my list of "frustratingly-beautiful Tangles that I must learn". Thank you so much for this modified step-out. Thank you so much for posting your alternate direction for Tripo! I could not figure out that tangle to save myself, and Sue makes it look so easy and graceful!! I was so frustrated. Then I found your post!!! I can see it now, and tangle it too! Thanks so much! Thank you so much for your take on tri-po. Perfect timing for me, as I have been trying most of this week to get this and couldn't until today. So again, Thank you. Of course while I was here I took a browse on your blog and you now have a new fan!